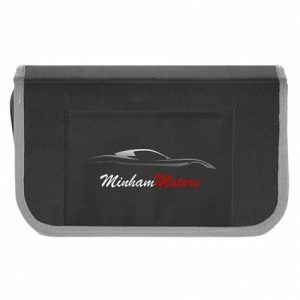 With it’s hard sided 600D case, zippered closure, this kit will be a welcome gift for auto related businesses and marketing programs. 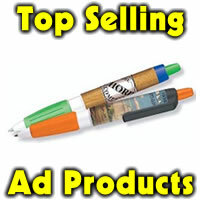 Also good referral partner gift or business or customer thank you gifts. 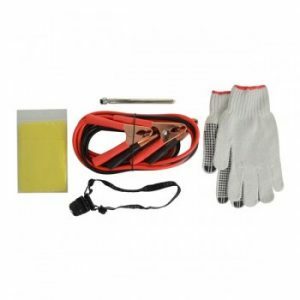 The kit includes jumper cables, 1 set of gloves, LED headlamp, poncho and tire gauge. The logo can be imprinted on the case pocket. Minimum is 25 for screen print or 100 for vivid expressions. Imprint is 3.75″ w x 2.75″ h. Screen printed 25 at 21.98 ea, 50 at 21.45 ea, 100 at 20.98 ea, 250 at 20.48 ea and 500 at 19.83 ea. Vivid expressions 100 at 21.98 ea, 250 at 21.48 ea, 500 at 20.98 ea. Set up for screen print is 55.00. Item A726.